(Nanowerk News) The merger of two black holes, such as the one which produced the gravitational waves discovered by the LIGO Observatory, is considered an extremely complex process that can only be simulated by the world's most powerful supercomputers. However, two theoretical physicists from the University of Barcelona (Spain) have demonstrated that what occurs on the space-time boundary of the two merging objects can be explained using simple equations, at least when a giant black hole collides with a tiny black hole ("Exact Event Horizon of a Black Hole Merger"). If we had to choose the most important and newsworthy piece of science news for 2016, the discovery of gravitational waves would have every chance of winning first prize. The two signals that have been produced so far came from the collision and merger of two black holes in some remote part of the universe. The first detection was announced in February and the second in June, both by scientists from the Laser Interferometer Gravitational-Wave Observatory (LIGO) in the United States. To determine the patterns of these waves and simulate how those mysterious fusions take place -a phenomenon characteristic of Einstein's general theory of relativity- scientists use the best supercomputers, such as the MareNostrum from Barcelona, Spain's most powerful supercomputer; however, there could be other, less complicated ways. Physicists Roberto Emparan and Marina Martínez from the University of Barcelona have found a simple and exact way to approach the subject of the event horizon of two merging black holes, where one is much smaller than the other. The event horizon is the boundary that characterises a black hole; whereas the events inside the event horizon cannot affect an observer on the outside, the opposite can occur. When two black holes merge together, their event horizons join together to become one. 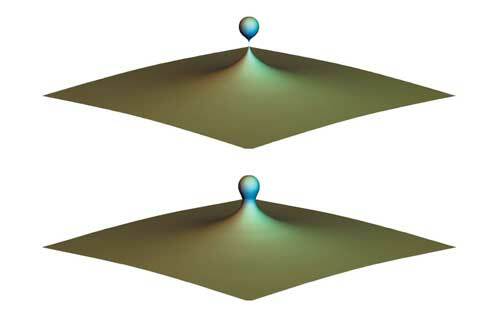 "Surprisingly, the ideas and techniques used in our work are elemental and allow us to thoroughly study the properties of the horizon at the moment both black holes join together to form one", points out Emparan, who along with his colleague has published the results in the journal 'Classical and Quantum Gravity'. The equations utilised to solve the problem are based on the physicists' basic knowledge, such as the definition of an event horizon and the so-called equivalence principle, which is part of the foundation of Einstein's theory of gravity. According to this idea, an observer cannot tell the difference between free falling in a gravitational field and floating in deep space. This is something we are familiar with because of pictures of astronauts on the International Space Station. Their noticeable weightlessness is not a result of their distance from Earth -gravity at the altitude of the station is 90% that of the gravity on Earth's surface- but is rather due to the fact that the orbiting station and the astronauts inside are freely moving through Earth's gravitational field. Likewise, in this study the small black hole that falls into a much larger one cannot tell this fall apart from another situation in which it is floating alone in space, thus allowing the description of the phenomenon to be greatly simplified. Emparan and Martínez have utilised geometric elements in their study in order to describe the event horizon. Specifically, the horizon is obtained by plotting null geodesic lines on the so-called Schwarzschild metric, the solution to the field equations posed by Einstein for describing the gravitation field of a black hole. According to the authors, these results make it easy to identify many geometric properties of the event horizon at the moment the two black holes join together. More importantly, "[the results] indicate the existence of a universal, general behaviour that occurs when two black holes come into contact with each other in any part of the universe".